Named for the orange hood on the male, this slender oriole is at home in suburban areas of the southwestern United States. It originally nested in the trees of desert oases, but finds ornamental trees suitable. When the nest is suspended from palm leaves, the female pokes holes in the leaf from below and pushes the fibers through, effectively sewing the nest to the leaf. Male bright orange with black bib, female drab yellow. Male colorful bright orange with black mask and throat, female drab and unpatterned. Similar in size. Entirely orange or orange-yellow head, nape, rump, and underparts. Black bib and narrow mask. Back black, with pale edges in fresh plumages. Wings black with two white wingbars, the upper one wide and bold, the lower one narrow. Tail black. Olive yellow on head, rump, and tail. Underparts dull, but brighter yellow. Back dull grayish olive. Two white wingbars, top one broader than lower. Wings dusky. Immature male resembles adult female, but with a black bib and mask less extensive than adult male. Head, nape, tail, and underparts yellow. Wings dusky gray with two white wingbars. Black bib. Immature female resembles adult female. Breeds in areas with scattered trees, such as desert oases and along streams. Also in mesquite brush. Common in urban and suburban areas. Fond of palm trees. Searches for insects among leaves; may hang upside down. Often perched near ground. Insects, spiders, nectar, and fruit. Altamira Oriole of south Texas is patterned like a male Hooded Oriole, but is larger and more robust with an orange shoulder and less black on the face. 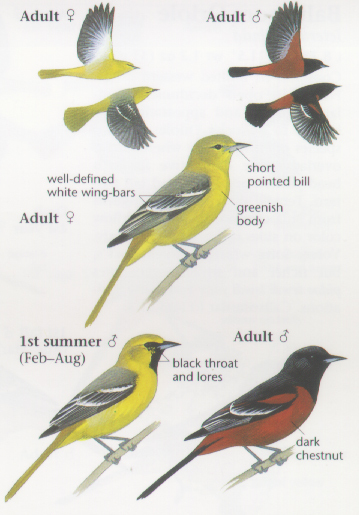 Adult male Bullock's Oriole has a black top of head and nape, a black eyestripe, a large white patch in the wings, and a mostly orange tail with a black tip. First-year male has black eyeline and whitish belly. Orchard Oriole female and first-year male similar to female and first-year male Hooded Oriole, but has shorter tail, shorter, less down-curved bill, and has a distinct second wingbar. Male Streak-backed Oriole is more reddish, has an orange and black streaked back, and a shorter tail. Adult female resembles first-year hooded male, but has a mostly orange, streaked back, two distinct wingbars, and a shorter tail. Song a rapid, choppy series of warbles. Call note a sharp, nasal "wheet." Also a rolling, dry chatter. Pleasants, B. Y., and D. J. Albano. 2001. Hooded Oriole (Icterus cucullatus). In The Birds of North America, No. 568. (A. Poole and F. Gill, eds.). 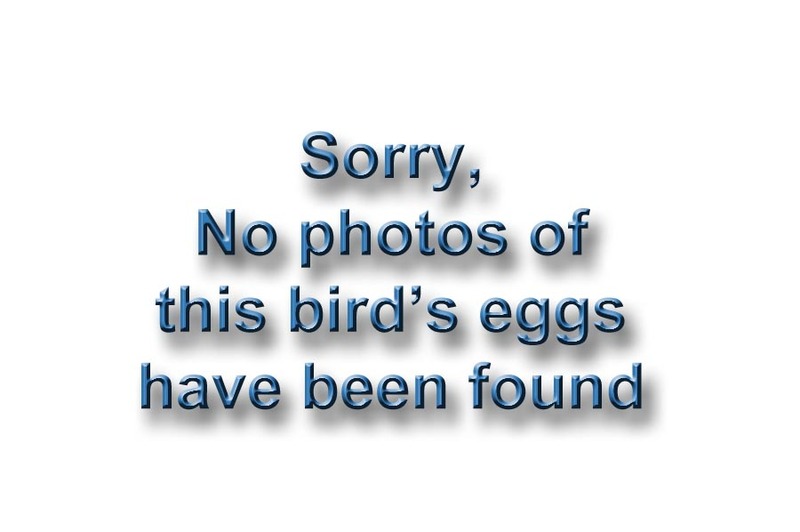 The Birds of North America, Inc., Philadelphia, PA.